We really value your prayers for our work across the world. As a Christian organisation we believe it is important for the goodness and grace of God to permeate all we do. We believe God will use your prayer to bring life in all its fullness to every child, family and community that we work in. 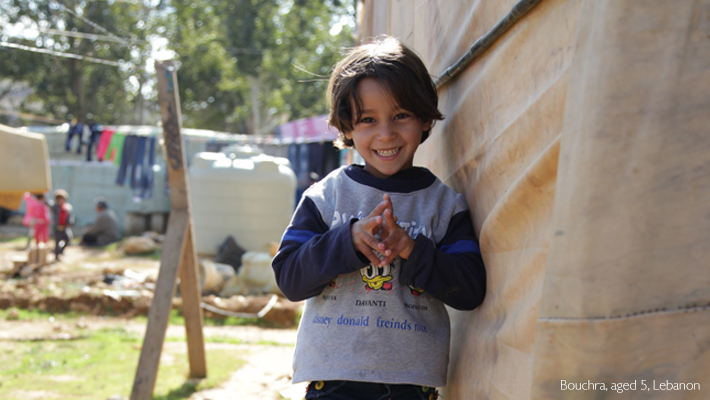 Salah is 12 years old and lives in a tent in an informal settlement in Bekkaa Valley, Lebanon. He used to come along to our Child Friendly Space, where he could play, find emotional support and receive non-formal schooling. "[Back in Syria] there were planes bombing the houses and the smell of dead bodies. I saw people laid on the ground and planes bombing and destroying buildings. I used to go to school in Syria, but when the war started we stopped going to school. I never feel happy anywhere but the Child Friendly Space...it’s the only place I’m happy." Unfortunately, Salah has had to stop coming to the Child Friendly Space. His family were struggling to buy enough food, water, clothes and fuel, despite working around the clock. So Salah has begun work to help support them. Please pray for Salah, that he will be able to find friendship, love and support from another place, now he can no longer come to the Child Friendly Space. Pray that Salah will know God’s peace and comfort. Pray that peace will come to Syria so Salah and his family can finally go home and start re-building their lives. 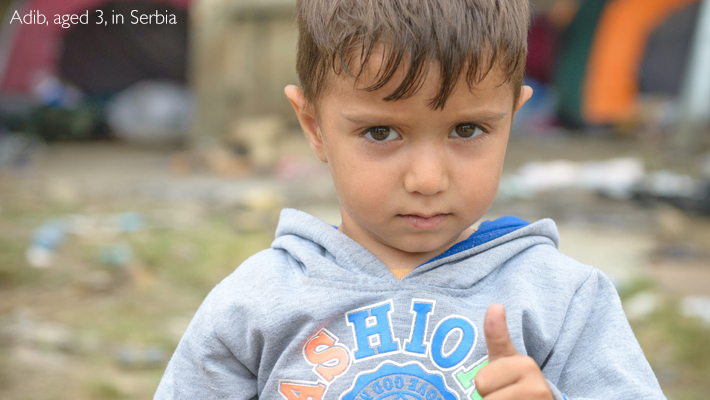 Three-year-old Adib gives a thumbs up, which seems at odds with his serious expression. His family fled the war back home and have been travelling for over a month to find safety in Europe. They're staying in a tent in an abandoned brick factory on the outskirts of the Serbian city, Subotica. Although it provides some shelter, the building is rickety and unsafe. Their journey has exhausted their resources. The last of their money went to a smuggler who promised to take them and another family safely into Hungary. He disappeared with the cash. Adib’s family need information, food, water and rest. And they needed a plan and a way to move on to a safe place, in Europe, where they can start to re-build life. Please pray for Adib and his family, that they would know God’s everlasting arms surrounding them. Pray they will not give up hope of finding a new home and place of safety where Abid can grow up. Pray that they will somehow find a way to gather enough money to continue on their journey. Bouchra is five years old and has lived as a refugee in Lebanon since she was two. Her family fled here after their home was destroyed by bombs in Syria. One of the biggest challenges in the refugee camp was water shortage. Drinking water cost over double their income to buy and the spring was far to reach and often dry. Bouchra’s mum, Zeinab, remembers: "I was pregnant, during my eighth month, and I used to carry heavy containers of water from the spring, located 1 km away. Sacrificing bread to get drinking water was the only solution available to many Syrian refugees during that time." Worse still was water for non-drinking uses like showering, cleaning the tent and washing dishes. The family had no choice but to use sewage water. Bouchra’s aunt, Khadijah, shared, "The water was full of worms. [The] colour was extremely disgusting. We used to get skin irritations and fungi all over our bodies." Recently, things have changed as we have started a water programme, distributing water tanks, water filters, soaps, hygiene and drainage kits; a weekly supply of water; monthly sewage de-sludging; and have installed latrines. The filter saved Zeinab from having to walk forty minutes to and from the spring, and she knows that the water she is drinking is safe for both herself and her unborn baby. Please pray for Bouchra and her family that they will know God’s blessing. We give thanks that the family now have access to clean water, which has helped ease one of the many challenges they face. We pray God would keep the family safe and give them His peace as they enter their fourth year away from home. Ahmed is 12 years old but looks younger than his age. 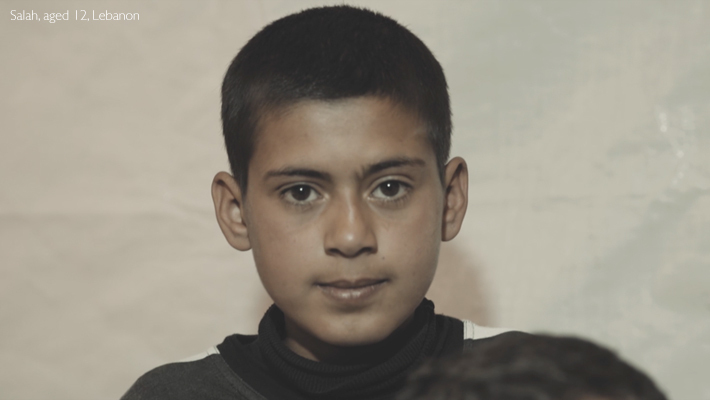 He arrived in Serbia without his mother and father; they stayed behind in Syria. 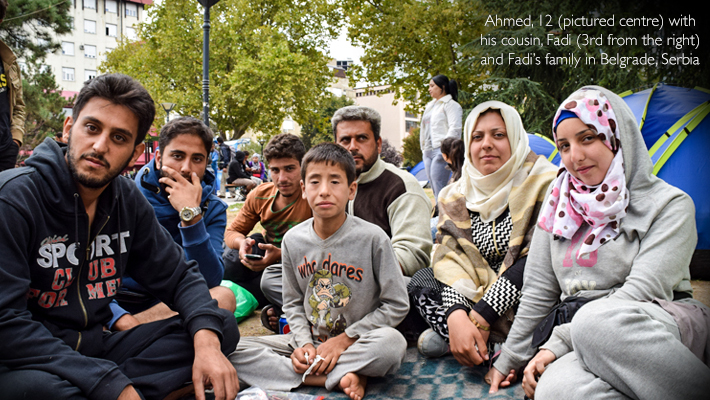 They couldn’t afford to pay for the whole family, so they sent him with his cousin, Fadi. "It is cheaper to get children out of Syria" Fadi explained "it costs half the price of an adult". Ahmed and Fadi have been robbed three times on their journey so far. After all their money was stolen they were robbed again for their tent and their shoes. They were badly beaten and walked barefoot to the Serbian border. More children arrive in Serbia like this each day: hungry, hurt, terrified. Many have painful blisters from walking many miles barefoot. They need to rest; they need food, water, warmth and shelter, urgently. Please pray that Ahmed and his cousin Fadi will reach a place of safety and security, where they can find rest, nourishment and medical care. 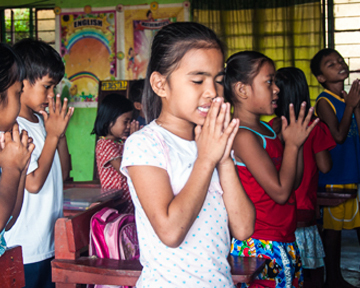 Pray that God would strengthen them and keep them safe. Pray too for World Vision’s staff, who are working to find, protect and care for vulnerable children like Ahmed, Fadi and Abdul Karim. Please pray that border officers, police, politicians and host communities in receiving countries will have empathy, compassion and patience for refugees. Pray for a quicker and more effective response in Europe. Please pray for national and local leaders, that they will have insight and wisdom to solve the underlying causes of this conflict and build peace in Syria. Pray they will understand and communicate well with each other.